Week 13 Community-Shared Agriculture (CSA) Box (plus the secrets of cooking, preparing & eating spaguetti squash) – Ashleigh Grange, R.H.N. This time of year is my absolute favourite: it’s the generous shoulder season straddling the most productive part of summer combined with the arrival of heartier veg with longer growing times that we can look forward to in autumn… squash (especially Delicata or sweet potato – my perennial favourite), cabbage, beets, carrots, cauliflower, Brussels sprouts (! ), and sweet potatoes, among them. I did a bit more cooking and some non-cooking this week since I’m back on my feet after that nasty summer cold that seemed to wipe me out. 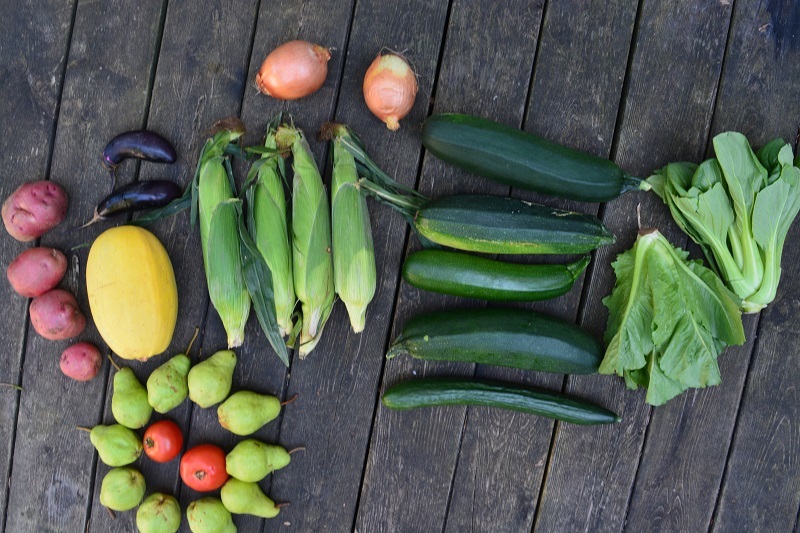 From top to bottom, left to right (mostly): Potatoes, eggplant, spaghetti squash, pears, tomatoes, cooking onions, sweet peaches & cream corn, zucchini, cucumber, romaine lettuce, bok choy. This week I finally got around to gobbling up the spaghetti squash that was patiently sitting out on the counter. They have a great shelf-life and last awhile… weeks, even months if properly cured and stored. Sadly some of mine didn’t make it – I don’t think they had enough curing time. Nonetheless I cooked off 3 or 4 of them and they made for great lunches during the week. Wash, slice them in half and then cook them at 400 F for about 40-60 minutes. Cook time is affected by size and size does matter here. When the flesh inside can be easily pierced, drag a fork across it and you’ll have the most beautiful strands that look just like spaghetti. 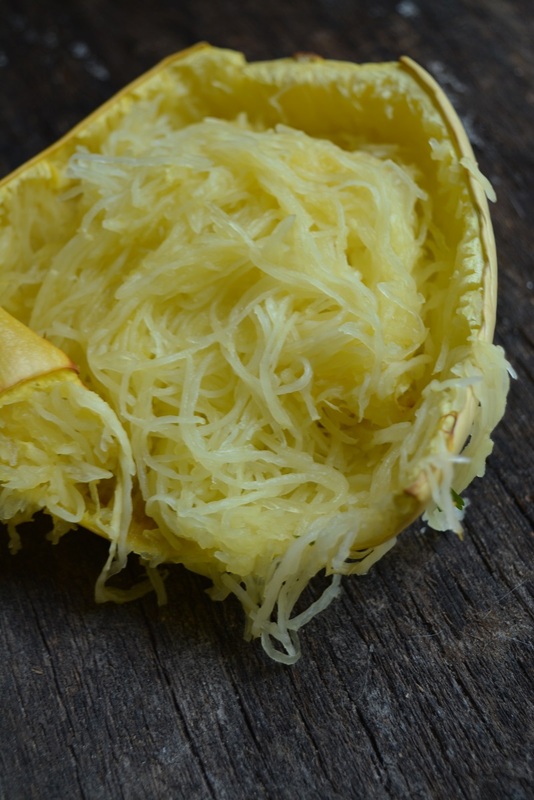 Curious about the nutritional benefits of spaghetti squash? Well, it’s a great low-carb replacement for pasta and a great source of fibre, carotenoids, manganese, potassium and copper. It’s unusual in that it contains a decent amount of B vitamins, which help support healthy blood sugar control. That, combined with the fibre, make this a great vegetable for overall good health. Plus with its canary yellow colour, it’s pretty to look at and colortherapy in itself can support good health! I topped this delicious “spaghetti” with one of my favourite tomato sauce recipes, Meghan Telpner’s Raw Marinara recipe (if you click the link, scroll down to the Amazingly Simple Marinara Sauce; I didn’t include olives). It comes together in minutes, no cooking needed. 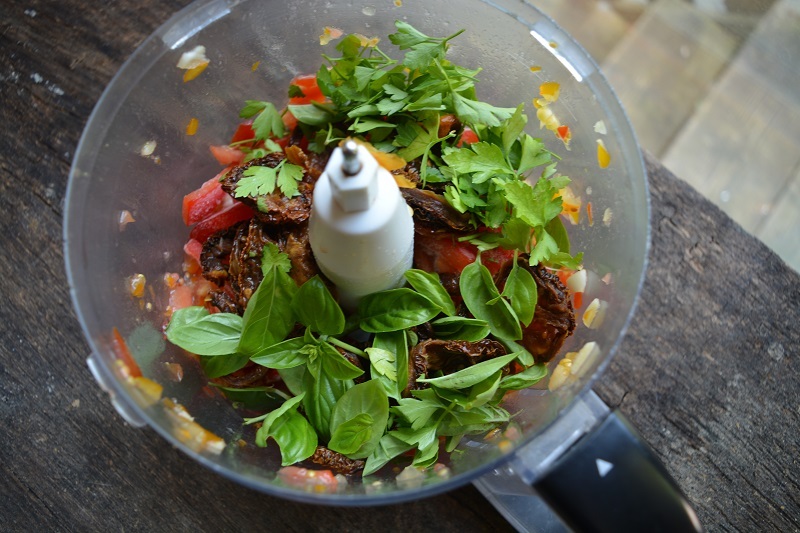 This sauce was a huge favourite when I did the Culinary Nutrition Expert (CNE) Program back in 2013 and continues to be because the punch of flavour from the fresh herbs and sun-dried tomatoes will cause you to do a double take! Healthy fast food. Later in the week, the weather was a bit cooler so I wasn’t afraid to have the oven on. 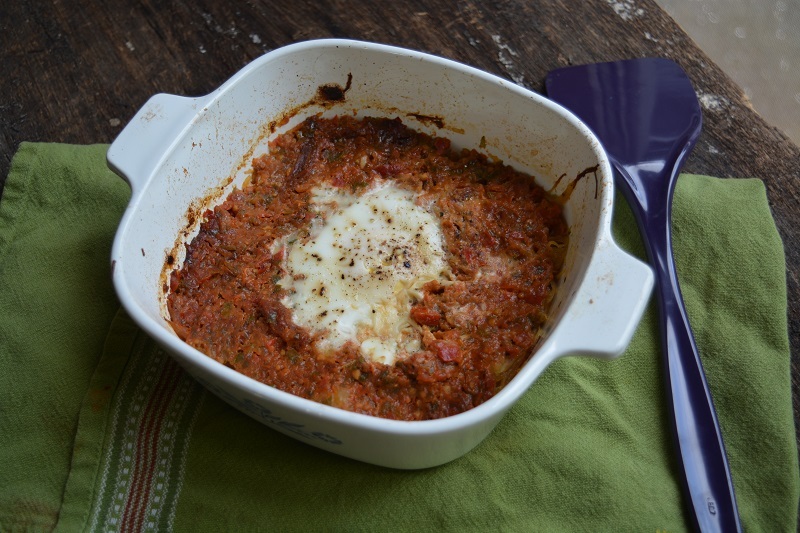 I layered the cooked spaghetti squash in a baking dish, followed by the raw marinara, made a well in the sauce and cracked an egg in it. Cooked at 350 F for about 20 minutes… just until the egg was cooked and everything was hot. That’s my idea of hot and ready. 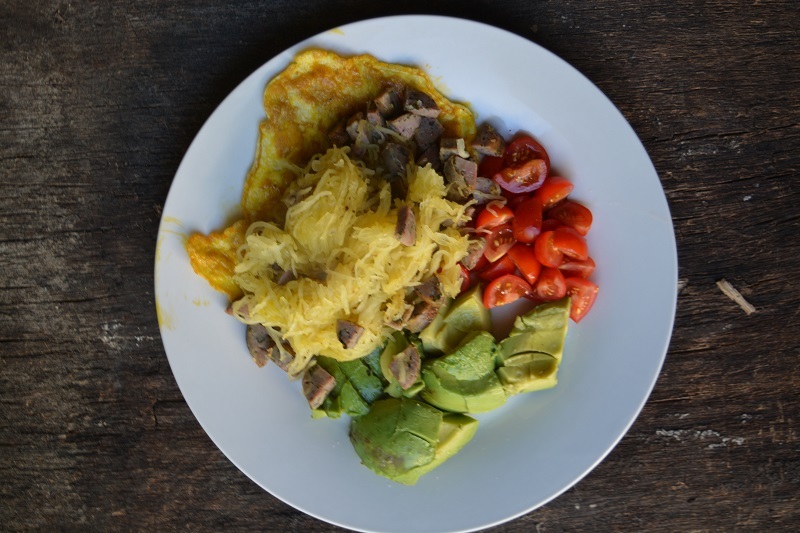 Herby omelette, spaghetti squash heated with some local kale and Parmesan sausage, cherry tomatoes with sesame oil, avocado. Breakfast is the most important meal of the day! Yes, I would eat like this every day if I could. And as with most winter squashes (like pumpkin, butternut squash, acorn squash, and spaghetti squash), you can clean and roast the seeds for a healthy zinc-rich snack. 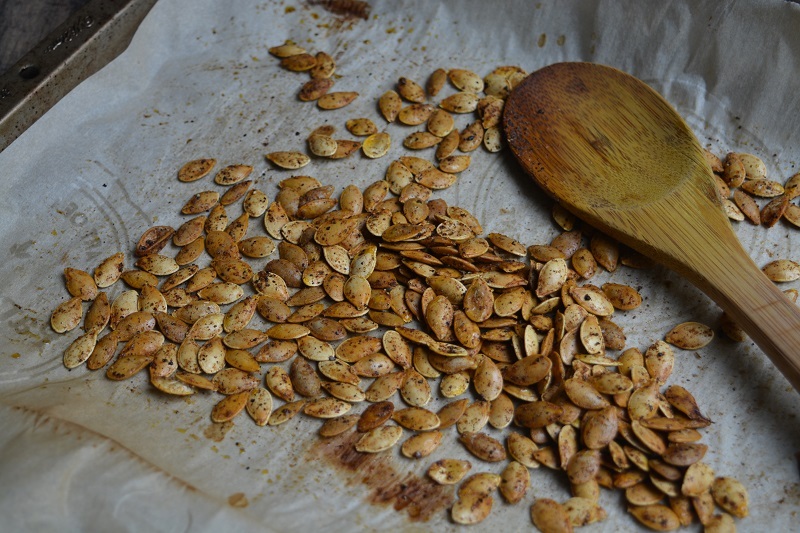 Follow the steps in my post How to Roast Pumpkin Seeds. The seeds were still a bit wet when I went to roast them so I baked them at a lower temp (300 F), for a bit longer. Keep an eye on them and they’ll turn out. I coated these with coconut oil, sea salt, paprika, chile powder, a bit of cumin, dried sumac and cinnamon. 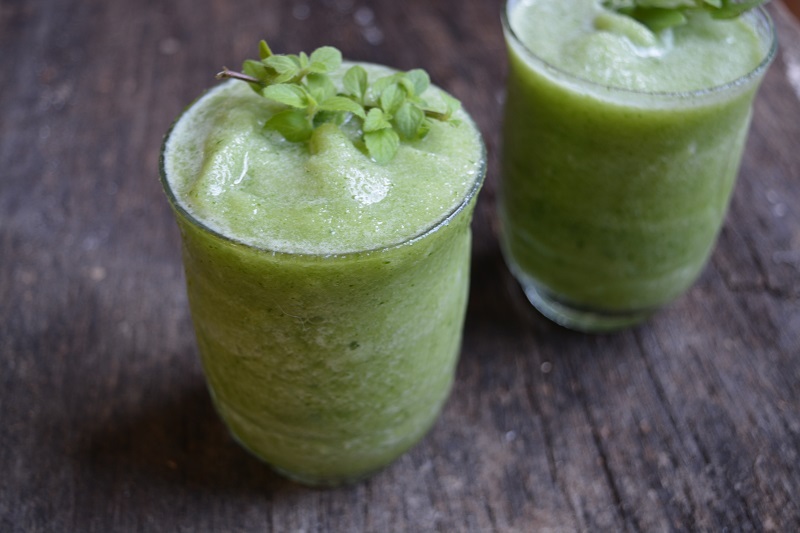 And now after all that fall-inspired cooking, let’s get back to summer with this frozen, minty Cucumber Slushie! Inspired by Heidi Swanson’s Cucumber Cooler recipe in her book Super Natural Every Day, I blended fresh cucumber, ice, lemon juice, tons and tons and tons of fresh banana mint from my garden (smells just like bananas! ), a tiny pinch of sea salt and the faintest lick of maple syrup. I’ve had this recipe bookmarked for awhile and I’m glad I finally made time for it. You can find a copy of the original recipe here. That’s what I call a CSA-loving summer cocktail. P.S. Need to catch up on this summer’s CSA bounty? This entry was posted in Local Food and tagged acorn squash, bok choy, cocktail, community shared agriculture, community supported agriculture, corn, cucumber, drink, edencrest farms, eggplant, farm share, food share, local food, onions, organic food, pears, potatoes, pumpkin seeds, romaine, seasonal eating, seasonal food, spaghetti squash, tomatoes, zucchini.